Standel (Standard electronics) was founded by Robert Crooks in Temple City, California in 1953. They were primarily involved in the production of guitar amplifiers, Crooks having initially been requested to build a custom amp by a certain Paul Bigsby to accompany his solid body guitars and pedal steels. 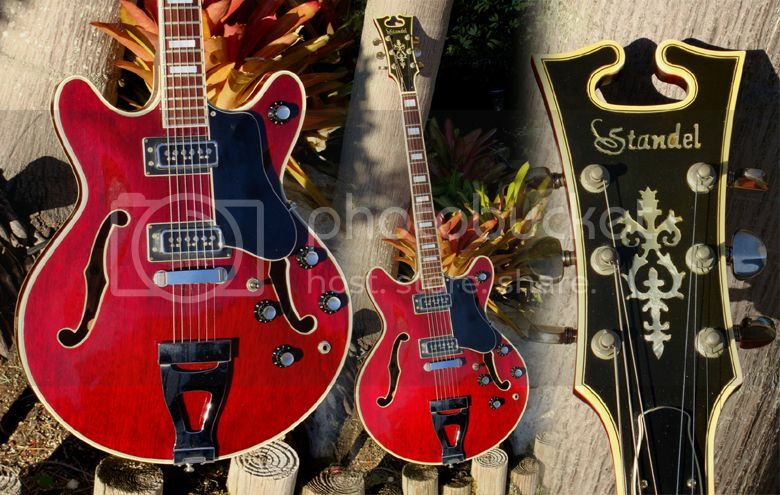 Guitars featuring the Standel name appeared 1961 and 1967 although these were actually built for Standel by Sam Koontz. As you can see on the above pictured Standel 520-C Deluxe Artist (supposedly from 1968 suggesting there is some confusion about the dates somewhere) there is a distinct Gretsch-like quality to the design to this particular model (other models had a more Mosrite-like aesthetic). The guitar features a mahogany body with maple laminated top, mahogany neck with Indian Rosewood fingerboard, and - furthering the Gretsch analogy - two D'Armond pickups. This guitar (which the seller inaccurately names as "Standell" rather than "Standel") is currently for sale on eBay with a Buy It Now price of $3,500. That this is no doubt a quality instrument, and a rare one at that, I will not dispute, but I'm not 100% convinced that it should be priced as if it were a vintage Gretsch from the same period. Thanks to Andy Stone who spied this beauty for sale on eBay. Hi, I randomly stumbled across this post. I bought this guitar from the Florida dealer in July 2012. He came down $1000, I still think I overpaid a little but the guitar is in beautiful condition with a good neck and no nicks or scratches, I love it.